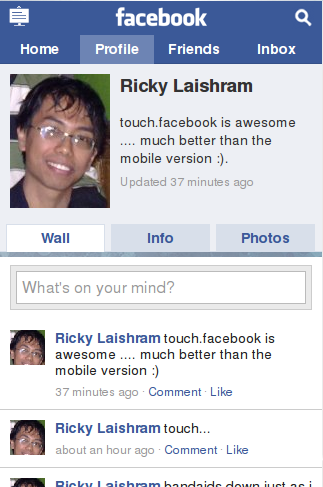 Yesterday Facebook launches a new touch site for touchscreen mobile devices. While it has always been very easy to use Facebook in iPhones and Android devices due to the availablity of good applications, it has always been difficult to use Facebook's mobile site in other touchscreen devices. According to some sources, Facebook has about 65 millions mobile users in September, 2009. With this new touch site, Facebook is looking to expand further by improving the user experience. Another very interesting thing is that even for non-touchscreen devices, the new touch site seems to be much better that you are better off using it rather than the mobile version. If you access Facebook mobile, you will find the link to the new touch site at the bottom, next to the link for the normal site. Or, you can just type http://touch.facebook.com/ to try it out.